To recover from recession, the global economy must rely on the strong performance of developing Asian economies, and it has become clear not only in Asia that regional cooperation and integration is key to regional economic development. Heavily reliant on external demand as an impetus to growth and closely linked to global financial markets, Asian economies are becoming closely integrated through trade, investment, and financial transactions. But how closely integrated are they, and what are the real benefits of integration? In line with its goal to foster economic growth and cooperation in the region, the Asian Development Bank, with Robert J. Barro and Jong-Wha Lee, have collected a formidable group of scholars to tackle the issues related to these questions. Costs & Benefits of Economic Integration in Asia offers quantifiable results from the field's top economists on cooperation and integration in the areas of trade, investment, and finance in Asia. Appealing to scholars, policymakers, and interested general readers, the book is an authoritative diagnosis of initiatives seeking to promote regional economic integration. It examines two broad divisions of cooperation and integration: monetary and financial, and trade and investment. Specific enquiries include such topics as comparisons to other regions such as Eastern Europe and Latin America, the effects of regional free trade agreements on overall trade and welfare, the distribution of benefits of unevenly distributed resource wealth among the region's economies, the possibility and desirability of an East Asian currency union, business cycle synchronization and its relationship with inflation targeting regime and trade, pre-World War I Asian monetary systems, the computation of the extent of foreign and domestic content in a country's exports, and many more. After financial disaster, the world's economy is changing drastically, and Asia will play a pivotal role in how these changes occur. 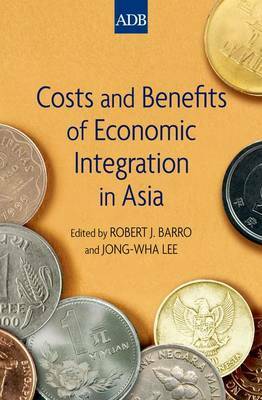 Costs & Benefits of Economic Integration in Asia is an essential reference on the controversy and consensus on economic integration, and how it will influence individual Asian countries, the region as a whole, and the world, for decades to come.